Background: High-dose chemotherapy followed by autologous hematopoietic stem cell transplant (HSCT) is the treatment of choice for patients with relapsed and refractory (RR) lymphoma. We analyzed toxicity and long-term outcome with lomustine, cytarabine, cyclophosphamide, etoposide (LACE) conditioning in patients with primary refractory or relapsed lymphoma undergoing autologous transplant. Materials and Methods: One-hundred patients with primary refractory (23), chemotherapy sensitive relapse (74) or RR (3) Hodgkin lymphoma (HL - 70 patients), and non-HL (NHL - 30 patients) underwent HSCT with LACE (lomustine 200 mg/m 2 day-7, etoposide 1000 mg/m 2 day-7, cytarabine 2000 mg/m 2 day-6 to day-5, and cyclophosphamide 1800 mg/m 2 day-4 to day-2) conditioning between November 2007 and December 2013. At transplant, 68 patients were in complete remission (CR), 29 in partial remission, 2 had stable disease, and 1 had progressive disease. Patients were followed up for development of transplant-related toxicities and long-term survival outcome. Results: The incidence of grades 3–4 oral mucositis and grades 3–4 diarrhea was 8% and 4%, respectively. Median days to myeloid and platelet engraftment were 10 and 13. Transplant-related mortality was 7%. At median follow-up of 3 years, probability of overall survival (OS) and progression-free survival (PFS) at 3 years was 70% and 58% in entire cohort, 78% and 62% in HL and 51% and 46% in NHL subgroup, respectively. 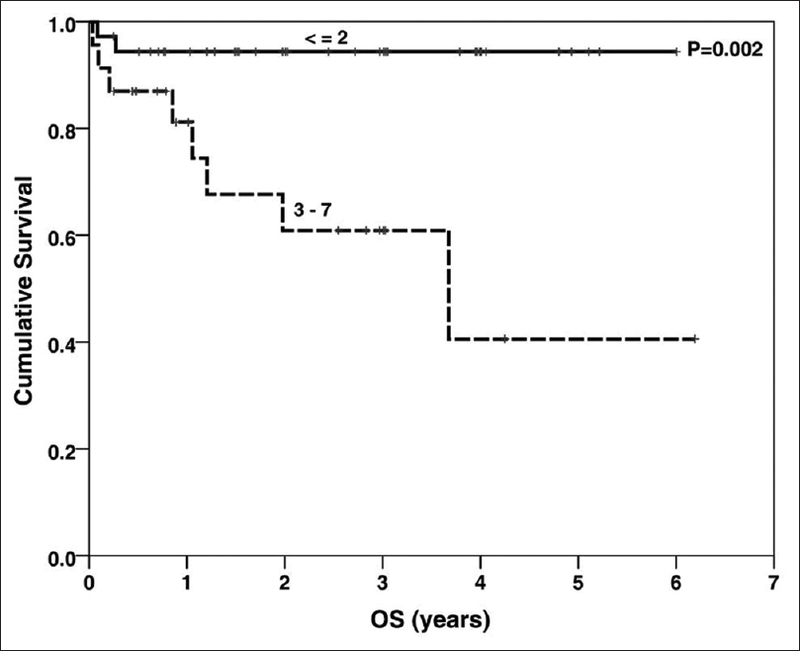 International Prognostic Score (IPS) >2 at relapse prognosticated for poor OS (P = 0.002) and PFS (P < 0.001) in HL subgroup. Positron emission tomography positivity pretransplant (HL subgroup) and at day + 100 (NHL subgroup) predicted for poor survival. Conclusion: We conclude that LACE is effective and well-tolerated conditioning regimen. IPS at relapse is the most important prognostic factor in HL transplant. Several studies have reported probability rates of 5 years OS post-HDT-HSCT in relapsed or refractory lymphomas ranging from 50% to 70% for HL ,,, and 40–50% for NHL., A minority of patients die due transplant-related causes (3–10%) while the majority of the remaining patients develop lymphoma relapse (30–40%) and have very poor outcome.,,,, Several studies have tried to identify risk factors for posttransplant lymphoma relapse and prognostic factors for OS.,,,,,, However, the results of these retrospective analyses have shown significant variability in terms of prognostic factors and the degree of impact of these factors on survival. In addition to conventional risk factors, recently the prognostic role of functional imaging with 18 F-fluoro-deoxy-D-glucose positron emission tomography (18 F-FDG-PET) has been evaluated in few studies.,, These studies provide some evidence that negative 18 F-FDG-PET status pretransplant may be an independent determinant of favorable outcome after HSCT in relapsed and refractory (RR) HL but not necessarily in NHL. We began using LACE regimen instead of BEAM in 2007 as BCNU was not readily available in our country in the year 2007–2008. In this study, we sought to evaluate efficacy and toxicity of LACE conditioning regimen as well as determine factors prognosticating for OS and PFS in this single largest reported cohort of patients with relapsed or refractory HL and NHL undergoing HDT with LACE regimen followed by HSCT. All patients who received LACE regimen for primary refractory, chemotherapy sensitive relapse or RR HL, and NHL between November 2007 and December 2013 were included in this retrospective study. Primary refractory disease included patients who either had stable disease (SD) or progressive disease (PD) after first-line chemotherapy or relapsed within 3 months of completing treatment. Chemotherapy sensitive relapse included patients with documented complete remission (CR) who had relapsed more than 3 months after treatment completion and had CR or partial response (PR) to salvage chemotherapy. RR disease included patients with documented CR who had relapsed more than 3 months after treatment completion and have not shown response to salvage chemotherapy. Written informed consent for stem cell harvest and for HDT followed by autologous HSCT was obtained separately from all patients. Salvage chemotherapy regimen used in these patients included gemcitabine, cisplatin, and dexamethasone (GDP); dexamethasone, cytarabine, and cisplatin (DHAP); ifosphamide, carboplatin, and etoposide (ICE); and ifosfamide, mitoxantrone, and etoposide (MINE), with or without rituximab. PET-CT was performed in all patients after 3 cycles of salvage chemotherapy and response assessment was done according to Cheson's criteria. Patients who achieved CR, PR, or SD on salvage chemotherapy were considered for HDT followed by HSCT. Peripheral blood stem cells (PBSCs) were mobilized using same salvage chemotherapy followed by granulocyte-colony stimulating factor (G-CSF) at 5 μg/kg/twice daily starting 5–7 days after completion of chemotherapy and continued till stem collection. PBSC harvest was done to collect at least 3 × 106/kg CD34 cells. Cells were cryopreserved with dimethyl sulfoxide (DMSO) to achieve a final DMSO concentration of 4.35–7.5% and stored at −80°C. Bone marrow harvest was done in patients who were ≤5 years of age and in those who could not be successfully mobilized through the peripheral blood. Conditioning regimen used was LACE (lomustine 200 mg/m 2 day-7, etoposide 1000 mg/m 2 day-7, cytarabine 2000 mg/m 2 day-6, day-5 and cyclophosphamide 1800 mg/m 2 day-4 to day-2). Cryopreserved CD34 positive stem cells at a dose of 2–6 × 106/kg were infused on the day of transplant. All patients received G-CSF 5 μg/kg/day IV starting on day +1 after stem cell infusion till absolute neutrophil count (ANC) was >1 × 109/L for three consecutive days. Packed red cell concentrates were given to keep hemoglobin >8.0 g/dl. Platelet concentrates were given when platelet count was <20 × 109/L. Antifungal prophylaxis used was voriconazole (86 patients), itraconazole (11 patients), or posaconazole (3 patients). Routine antibacterial prophylaxis was not given. Oral acyclovir was used as antiviral prophylaxis. Neutropenic infections and other regimen-related toxicities including mucositis and diarrhea were managed as per standard clinical practice. Patients were discharged from transplant unit after achieving myeloid and platelet engraftment along with complete resolution of any infection or regimen-related acute toxicity. PET-CT was done on day +100 and at 1 year posttransplant. Responses were evaluated as per Cheson's criteria. Toxicities in the first 100 days of transplant were recorded. The severity and duration of oral mucositis were recorded according to WHO toxicity criteria. All other toxicities were recorded according to Common Terminology Criteria for Adverse Events Version 3.0. The duration of administration of total parenteral nutrition (TPN) was recorded. Duration of hospital stay was recorded as time in days from date of transplant to date of discharge. Sinusoidal obstruction syndrome of the liver was defined according to the Seattle criteria. Time to myeloid engraftment was defined as first of three consecutive days with an ANC ≥0.5 × 109/L. Time to platelet engraftment was defined as first of seven consecutive days when the platelet count was maintained ≥20 × 109/L without platelet transfusion. Failure to engraft by day +30 was considered primary engraftment failure. Engraftment fever was defined as fever (≥100.0°F) occurring in the peri-engraftment period for which no infectious cause was ascertained, and there was resolution of fever with use of systemic steroids. Broad spectrum antibiotics were initiated/escalated if fever did not respond within 48 h, or earlier if patient showed signs of clinical worsening. Probabilities of OS and PFS were estimated using the Kaplan–Meier method. OS was defined as the time interval between date of transplant to date of death from any cause or date of last follow-up. PFS was defined as the time interval from the date of transplant to the date of disease progression, relapse, death from any cause or last follow-up if in CR. TRM was defined as any death unrelated to relapse or disease progression within first 100 days after transplant. Prognostic factors for OS and PFS were evaluated separately for HL and NHL subgroup. 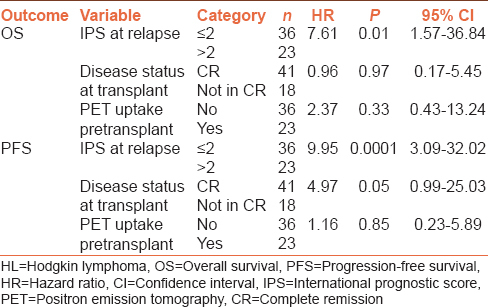 These included International Prognostic Score (IPS) at diagnosis and at relapse (advanced HL); International Prognostic Index (IPI) at diagnosis and at relapse (NHL); disease status at transplant (CR vs. not in CR); interval between diagnosis and transplant; PET positivity pretransplant and at day + 100. Univariate comparisons of OS and PFS for potential prognostic factors were made using the log-rank test. Multivariate analysis of significant factors was performed by Cox regression analysis. 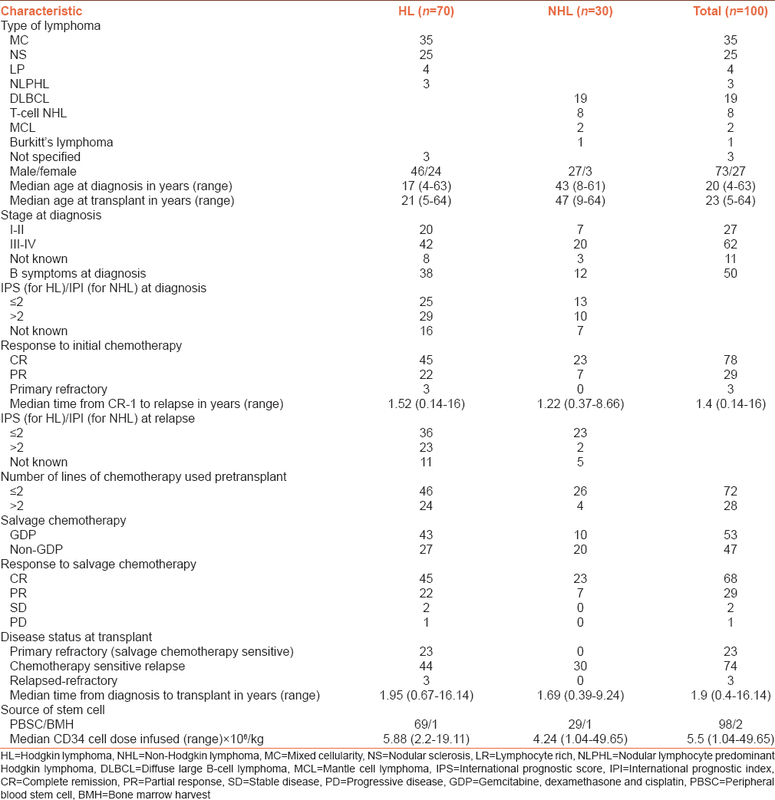 One-hundred patients who underwent autologous HSCT for primary refractory (23 patients), chemotherapy sensitive relapse (74 patients) or RR (3 patients) lymphoma were included [Table 1]. Seventy patients had HL while 30 NHL (male - 73, female - 27) with median age of 21 years in HL cohort and 47 years in NHL cohort at the time of transplant. Seventy-one patients included in the study had CR, 6 had PR while 23 patients had primary refractory disease with first line chemotherapy. The median time from CR-1 to relapse was 1.4 years. The median number of lines of chemotherapy used pretransplant was 2. All 23 patients with primary refractory disease had HL and all of them responded (CR or PR) to first line salvage chemotherapy before transplant. Among the remaining 77 patients who had relapsed lymphoma, 74 patients responded (CR or PR) to salvage chemotherapy while 3 patients did not (2 SD; 1 PD). At the time of transplant, 68 patients had CR, 29 had PR, and 3 had RR disease. Median time from diagnosis to transplant was 1.9 years. All patients received salvage chemotherapy. Fifty-three patients received GDP as salvage chemotherapy regimen before transplant while remaining received MINE (22 patients), ICE (9 patients), DHAP (4 patients), and other regimens (12 patients). There was no difference in CR rates with GDP (70%) compared to all other regimens (65%). However, median number of days of stem cell collection was less with GDP (1 day) compared to other salvage regimens (2 days) used (P = 0.003). The median follow-up of entire cohort was 3 years; of HL subgroup was 2.84 years and of NHL subgroup was 3.03 years. The incidence of grades 3–4 oral mucositis was 8% with a median duration of 3.5 (range 1–5) days [Table 2]. The incidence of grades 3–4 diarrhea was 4% with median duration of 3 (range 1–16) days. Median days to myeloid and platelet engraftment were 10 (range 7–15) and 13 (6–38) range, respectively. Median duration of hospital stay was 17 (range 13–99) days. After a median follow-up of 3 years, probability of OS and PFS at 3 years was 70% and 58% for the whole group [Figure 1] and [Figure 2]. 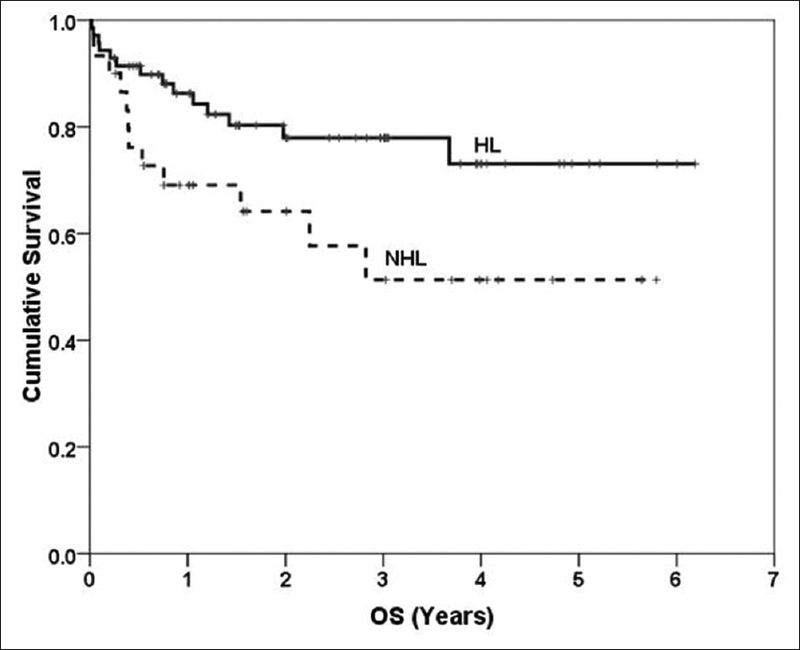 Probability of OS and PFS at 3 years was 78% [Figure 3] and 62% in HL subgroup and 51% [Figure 3] and 46% in NHL subgroup. Seven patients died due to transplant-related causes including 6 due to neutropenic sepsis and 1 due to herpes simplex encephalitis. Analysis of prognostic factors for survival in HL subgroup revealed IPS 0–2 at relapse to be associated with significantly better OS (P = 0.002) and PFS (P < 0.001) compared to IPS >2 [Table 3] and [Figure 4]. There was no impact of baseline IPS on PFS or OS. HL patients who were in CR at the time of transplant had superior OS (86% vs. 64% at 3 years; P = 0.032) and PFS (78% vs. 35% at 3 years; P = 0.001). Also, HL patients with PET negativity pretransplant had better OS (P = 0.01) and PFS (P < 0.01). There was no difference in PFS and OS between patients who had primary progressive HL and those who had relapsed HL. On multivariate analysis [Table 4], IPS >2 at relapse was the only factor which prognosticated for inferior OS (hazard ratio [HR] of 7.6; 95% confidence interval [95% CI] 1.57–36.84; P = 0.01) and inferior PFS (HR of 9.9; 95% CI 3.09–32.02; P < 0.001) in HL subgroup. In NHL subgroup, PET negativity on day +100 (P = 0.012) and longer interval (>1.9 years) between diagnosis and transplant (P = 0.027) predicted for better OS [Table 5]. However, the significance was lost for both the factors on multivariate analysis. There was no impact of baseline IPI and IPI at relapse on PFS or OS. Individual studies and analysis of registry data report that HDT followed by autologous HSCT provides a significant improvement in PFS but not in OS compared to nontransplant salvage chemotherapy in RR lymphoma transplant., Most effective HDT regimen in lymphoma transplant would be one which is associated with least toxicity and maximum survival. However, this remains to be established. Though chemotherapy-only regimens have been found superior to TBI-based regimen in toxicity and survival, no two chemotherapy-only regimens have been compared in a prospective manner. Retrospective analysis of chemotherapy-only conditioning regimens has shown variable results. One study reported better PFS and OS with BEAM/BEAC compared to CBV. Comparison of BEAM with BEAC has shown mixed results with one study reporting similar OS, while another reporting superior OS with BEAM. Favorable toxicity profile is another factor taken into consideration while deciding on a particular HDT regimen. In this regard BEAC has been found to be associated with less severe mucositis but longer time to myeloid engraftment compared to BEAM. LACE has shown good efficacy and favorable toxicity profile in lymphoma transplant., Initial results with LACE conditioning when compared with our historical cohort of patients treated with BEAM found LACE to have a better toxicity profile with similar survival outcome. Thereafter, we have continued using LACE, and here we report our experience with LACE conditioning in lymphoma transplant. Probability of PFS and OS at 3 years was 58% and 70%, respectively. This compares well with other similar studies that have evaluated survival postautologous HSCT in refractory/relapsed lymphomas.,,,, Probability of PFS and OS at 3 years in HL subgroup was 78% and 62%, which was higher compared to 51% and 46% in NHL subgroup. In addition, survival outcomes in patients with primary refractory HL who responded to salvage chemotherapy were similar to those who had chemotherapy sensitive relapse. These findings also compare well with similar studies in patients with HL,,,,, as well as NHL., One study evaluating LACE conditioning exclusively in RR HL patients found 5 years probability of PFS and OS to be 64% and 68%, respectively. Another study evaluating LACE conditioning exclusively in relapsed/refractory NHL patients found 5 years probability of PFS and OS to be 42% and 47%, respectively. Our results with LACE conditioning correlate well these studies. Although there is no head to head comparison of survival outcome between LACE and other conditioning regimens, probability of OS at 5 years in patients with relapsed NHL with LACE appears to be similar to that with BEAM and superior to that with BEAC/CBV regimens., In patients with relapsed HL, probability of OS at 5 years with LACE regimen appears to be similar to BEAM/CBV,, and superior to MBE. Regimen-related toxicity leads to increased morbidity and mortality in posttransplant period. Overall, LACE conditioning was well-tolerated. TRM was 7% which is comparable to other similar studies that used BEAM/BEAC,,, or LACE conditioning., Incidence of grades 3–4 oral mucositis in our study was low at 8% which is similar to that reported with LACE conditioning earlier., Grades 3–4 oral mucositis developing secondary to conditioning regimen is associated with increased risk of neutropenic sepsis, increased TPN requirement, increased treatment costs and longer hospital stay., The incidence of any grade oral mucositis reported with BEAM conditioning has been relatively high and has varied between 25% and 100%.,, Lower incidence of oral mucositis with LACE is mainly attributed to the exclusion of melphalan in the conditioning regimen which is a well-known chemotherapeutic agent implicated in causing mucositis. An important finding in our study is the relatively shorter median time to myeloid (10 days) and platelet (13 days) engraftment compared to what has been reported earlier with BCNU-containing regimens (12–13 days for myeloid and 15–16 days for platelet engraftment).,, This finding is even better than what has been reported earlier with LACE regimen by others (14 days to myeloid and 18–21 days with platelet engraftment)., Shorter time to engraftment is associated with decreased risk for neutropenic sepsis and shorter hospital stay. The median duration of time from transplant to discharge in our study was 17 days which was relatively less compared to that reported in studies that have used BCNU-containing regimens (20–21 days) or TBI-containing regimens (25 days). PET positivity pretransplant (in HL subgroup) and at day +100 (in NHL subgroup) predicted for decreased OS and PFS in univariate analysis. This prognostic value of PET in lymphoma transplant on PFS and OS further substantiates and is in concordance with what has been reported earlier.,,, However, the prognostic significance of PET positivity was lost on multivariate analysis, probably due to small sample size. On the basis of these findings seen in our study, at this point, we would like to state that PET/CT should be performed for all patients pretransplant and on day +100 posttransplant. This would not only help in prognosticating for PFS and OS but will also allow for consideration and implementation of any salvage strategies if feasible posttransplant in a timely manner. Most important prognostic factor in multivariate analysis in HL subgroup was IPS at relapse. 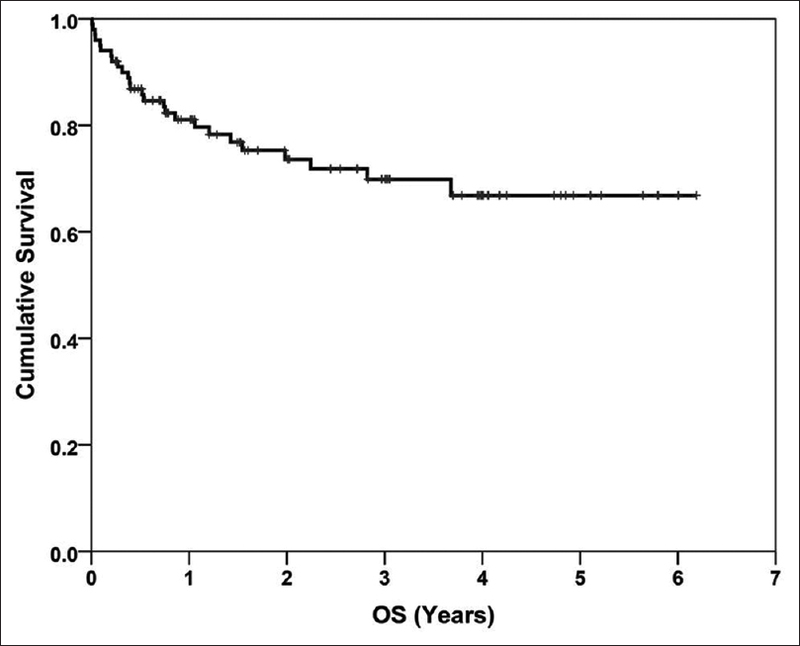 IPS 0–2 at relapse was associated with significantly better OS and PFS. This finding is in concordance with another similar study. In contrast to what has been reported earlier, we found no prognostic impact of time interval between diagnosis and transplant and baseline IPS on PFS and OS in HL subgroup.,,,,,,,, However, HL patients in CR pretransplant had better PFS and OS compared to those who were not. 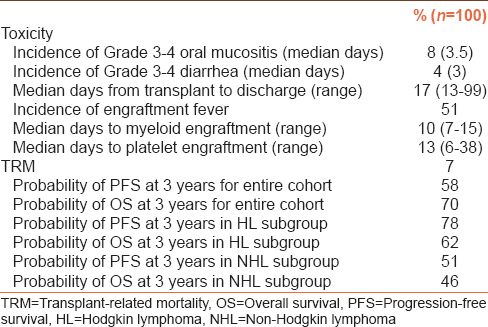 In NHL subgroup, PET negativity on day +100 and longer interval between diagnosis and transplant predicted for better OS. However, the significance was lost on multivariate analysis because of smaller number of patients in NHL subgroup. Use of GDP as salvage chemotherapy regimen required lesser number of days for adequate PBSC harvest without any impact on response rates, PFS or OS, suggesting that GDP is associated with better stem cell yield compared to other salvage regimens. However, this finding needs to be evaluated further. One limitation of this retrospective study is that 97 patients who underwent transplant had chemotherapy sensitive disease (CR or PR on salvage chemotherapy) pretransplant. Although it is a general practice to take chemotherapy sensitive disease for transplant, still this might have contributed to favorable PFS and OS seen with LACE regimen in our patients. Another limitation is the heterogeneity in the patient population with respect to the diagnosis. Nevertheless, this is the largest reported cohort of lymphoma patients transplanted with LACE regimen. We conclude that LACE is effective and well-tolerated conditioning regimen in lymphoma transplant. It is associated with low regimen-related toxicity, relatively faster engraftment, acceptable TRM and favorable long-term survival. IPS at relapse is the most important prognostic factor for survival in HL patients. PET/CT performed at specific time-points pre- and post-transplant can provide useful prognostic information in lymphoma transplant. However, the question regarding the best conditioning regimen for lymphoma transplant remains unanswered. A case-matched control study with contemporary registry data, and longer follow-up is probably required to establish the best conditioning regimen in lymphoma transplant if any. Blay J, Gomez F, Sebban C, Bachelot T, Biron P, Guglielmi C, et al. The international prognostic index correlates to survival in patients with aggressive lymphoma in relapse: Analysis of the PARMA trial. Parma Group. Blood 1998;92:3562-8. Philip T, Armitage JO, Spitzer G, Chauvin F, Jagannath S, Cahn JY, et al. High-dose therapy and autologous bone marrow transplantation after failure of conventional chemotherapy in adults with intermediate-grade or high-grade non-Hodgkin's lymphoma. N Engl J Med 1987;316:1493-8. Philip T, Guglielmi C, Hagenbeek A, Somers R, Van der Lelie H, Bron D, et al. Autologous bone marrow transplantation as compared with salvage chemotherapy in relapses of chemotherapy-sensitive non-Hodgkin's lymphoma. N Engl J Med 1995;333:1540-5. Sureda A, Arranz R, Iriondo A, Carreras E, Lahuerta JJ, García-Conde J, et al. Autologous stem-cell transplantation for Hodgkin's disease: Results and prognostic factors in 494 patients from the Grupo Español de Linfomas/Transplante Autólogo de Médula Osea Spanish Cooperative Group. J Clin Oncol 2001;19:1395-404. Moskowitz CH, Nimer SD, Zelenetz AD, Trippett T, Hedrick EE, Filippa DA, et al. A 2-step comprehensive high-dose chemoradiotherapy second-line program for relapsed and refractory Hodgkin disease: Analysis by intent to treat and development of a prognostic model. Blood 2001;97:616-23. Czyz J, Dziadziuszko R, Knopinska-Postuszuy W, Hellmann A, Kachel L, Holowiecki J, et al. Outcome and prognostic factors in advanced Hodgkin's disease treated with high-dose chemotherapy and autologous stem cell transplantation: A study of 341 patients. Ann Oncol 2004;15:1222-30. Sirohi B, Cunningham D, Powles R, Murphy F, Arkenau T, Norman A, et al. Long-term outcome of autologous stem-cell transplantation in relapsed or refractory Hodgkin's lymphoma. Ann Oncol 2008;19:1312-9. Vose JM, Anderson JR, Kessinger A, Bierman PJ, Coccia P, Reed EC, et al. High-dose chemotherapy and autologous hematopoietic stem-cell transplantation for aggressive non-Hodgkin's lymphoma. J Clin Oncol 1993;11:1846-51. Crilley P, Lazarus H, Topolsky D, Ciobanu N, Creger RJ, Fox RM, et al. Comparison of preparative transplantation regimens using carmustine/etoposide/cisplatin or busulfan/etoposide/cyclophosphamide in lymphoid malignancies. Semin Oncol 1993;20 4 Suppl 4:50-4. Mounier N, Gisselbrecht C. Conditioning regimens before transplantation in patients with aggressive non-Hodgkin's lymphoma. Ann Oncol 1998;9 Suppl 1:S15-21. Salar A, Sierra J, Gandarillas M, Caballero MD, Marín J, Lahuerta JJ, et al. Autologous stem cell transplantation for clinically aggressive non-Hodgkin's lymphoma: The role of preparative regimens. Bone Marrow Transplant 2001;27:405-12. Mills W, Chopra R, McMillan A, Pearce R, Linch DC, Goldstone AH. BEAM chemotherapy and autologous bone marrow transplantation for patients with relapsed or refractory non-Hodgkin's lymphoma. J Clin Oncol 1995;13:588-95. 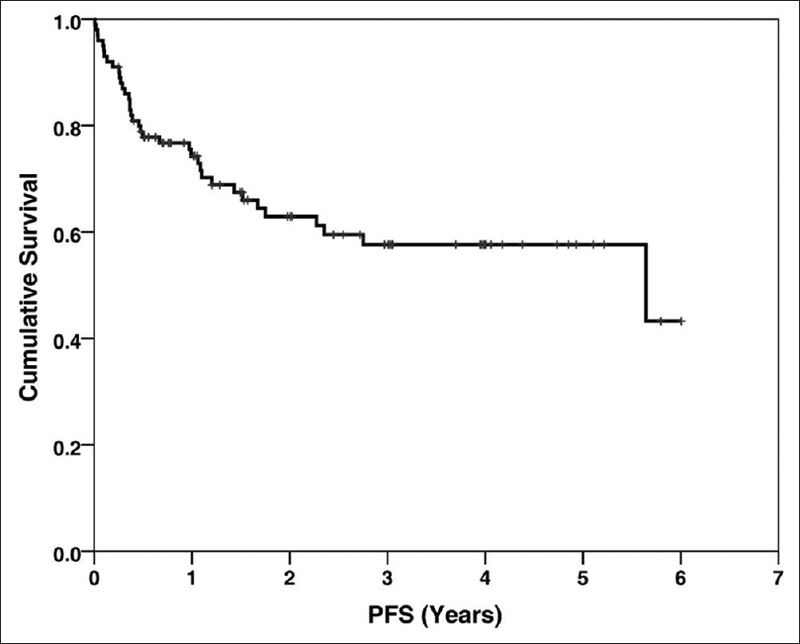 Linch DC, Vaughan Hudson B, Anderson L, Vaughan Hudson G. Impact of high-dose salvage therapy (BEAM) on overall survival in younger patients with advanced large-cell lymphomas entered into BNLI trials. Ann Oncol 1997;8 Suppl 1:63-5. Wheeler C, Strawderman M, Ayash L, Churchill WH, Bierer BE, Elias A, et al. Prognostic factors for treatment outcome in autotransplantation of intermediate-grade and high-grade non-Hodgkin's lymphoma with cyclophosphamide, carmustine, and etoposide. J Clin Oncol 1993;11:1085-91. Perz JB, Giles C, Szydlo R, O'Shea D, Sanz J, Chaidos A, et al. LACE-conditioned autologous stem cell transplantation for relapsed or refractory Hodgkin's lymphoma: Treatment outcome and risk factor analysis in 67 patients from a single centre. Bone Marrow Transplant 2007;39:41-7. Pavlu J, Auner HW, Ellis S, Szydlo RM, Giles C, Contento A, et al. LACE-conditioned autologous stem cell transplantation for relapsed or refractory diffuse large B-cell lymphoma: Treatment outcome and risk factor analysis from a single centre. Hematol Oncol 2011;29:75-80. Czyz A, Lojko-Dankowska A, Dytfeld D, Nowicki A, Gil L, Matuszak M, et al. Prognostic factors and long-term outcome of autologous haematopoietic stem cell transplantation following a uniform-modified BEAM-conditioning regimen for patients with refractory or relapsed Hodgkin lymphoma: A single-center experience. Med Oncol 2013;30:611. Sureda A, Constans M, Iriondo A, Arranz R, Caballero MD, Vidal MJ, et al. Prognostic factors affecting long-term outcome after stem cell transplantation in Hodgkin's lymphoma autografted after a first relapse. Ann Oncol 2005;16:625-33. Bierman PJ, Lynch JC, Bociek RG, Whalen VL, Kessinger A, Vose JM, et al. The international prognostic factors project score for advanced Hodgkin's disease is useful for predicting outcome of autologous hematopoietic stem cell transplantation. Ann Oncol 2002;13:1370-7. Jabbour E, Hosing C, Ayers G, Nunez R, Anderlini P, Pro B, et al. Pretransplant positive positron emission tomography/gallium scans predict poor outcome in patients with recurrent/refractory Hodgkin lymphoma. Cancer 2007;109:2481-9. Moskowitz AJ, Yahalom J, Kewalramani T, Maragulia JC, Vanak JM, Zelenetz AD, et al. Pretransplantation functional imaging predicts outcome following autologous stem cell transplantation for relapsed and refractory Hodgkin lymphoma. Blood 2010;116:4934-7. Cocorocchio E, Peccatori F, Vanazzi A, Piperno G, Calabrese L, Botteri E, et al. High-dose chemotherapy in relapsed or refractory Hodgkin lymphoma patients: A reappraisal of prognostic factors. Hematol Oncol 2013;31:34-40. Cheson BD, Pfistner B, Juweid ME, Gascoyne RD, Specht L, Horning SJ, et al. Revised response criteria for malignant lymphoma. J Clin Oncol 2007;25:579-86. McDonald GB, Hinds MS, Fisher LD, Schoch HG, Wolford JL, Banaji M, et al. Veno-occlusive disease of the liver and multiorgan failure after bone marrow transplantation: A cohort study of 355 patients. Ann Intern Med 1993;118:255-67. Schmitz N, Pfistner B, Sextro M, Sieber M, Carella AM, Haenel M, et al. Aggressive conventional chemotherapy compared with high-dose chemotherapy with autologous haemopoietic stem-cell transplantation for relapsed chemosensitive Hodgkin's disease: A randomised trial. Lancet 2002;359:2065-71. Linch DC, Winfield D, Goldstone AH, Moir D, Hancock B, McMillan A, et al. Dose intensification with autologous bone-marrow transplantation in relapsed and resistant Hodgkin's disease: Results of a BNLI randomised trial. Lancet 1993;341:1051-4. Jo JC, Kang BW, Jang G, Sym SJ, Lee SS, Koo JE, et al. BEAC or BEAM high-dose chemotherapy followed by autologous stem cell transplantation in non-Hodgkin's lymphoma patients: Comparative analysis of efficacy and toxicity. Ann Hematol 2008;87:43-8. Khattry N, Jain R, Thippeswamy R, Gore A, Bhosale B, Jeevangi N, et al. Comparison of toxicity and outcomes of BCNU-containing conditioning regimens vs LACE in lymphoma transplants: A retrospective multicenter analysis. Blood 2011;118:S2023. Ruescher TJ, Sodeifi A, Scrivani SJ, Kaban LB, Sonis ST. The impact of mucositis on alpha-hemolytic streptococcal infection in patients undergoing autologous bone marrow transplantation for hematologic malignancies. Cancer 1998;82:2275-81. Bolwell BJ, Kalaycio M, Sobecks R, Andresen S, Kuczkowski E, Bernhard L, et al. A multivariable analysis of factors influencing mucositis after autologous progenitor cell transplantation. Bone Marrow Transplant 2002;30:587-91. Caballero MD, Rubio V, Rifon J, Heras I, García-Sanz R, Vázquez L, et al. BEAM chemotherapy followed by autologous stem cell support in lymphoma patients: Analysis of efficacy, toxicity and prognostic factors. Bone Marrow Transplant 1997;20:451-8. Jantunen E, Kuittinen T, Nousiainen T. BEAC or BEAM for high-dose therapy in patients with non-Hodgkin's lymphoma? A single centre analysis on toxicity and efficacy. Leuk Lymphoma 2003;44:1151-8. Devillier R, Coso D, Castagna L, Brenot Rossi I, Anastasia A, Chiti A, et al. Positron emission tomography response at the time of autologous stem cell transplantation predicts outcome of patients with relapsed and/or refractory Hodgkin's lymphoma responding to prior salvage therapy. Haematologica 2012;97:1073-9.